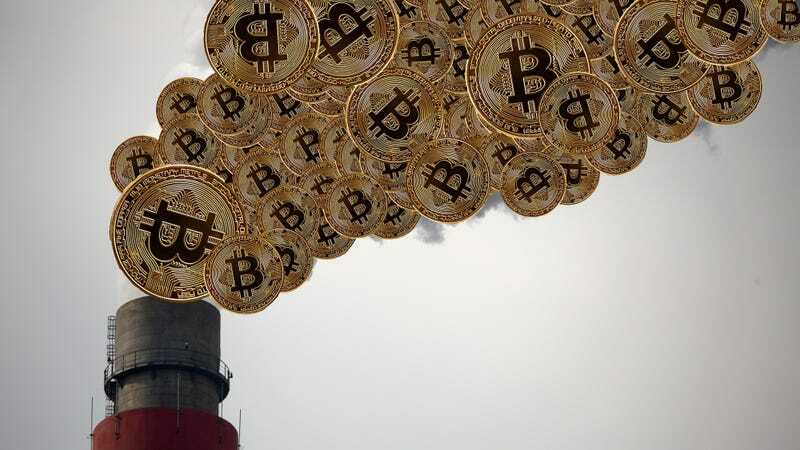 But a new study published on Monday in Nature Sustainability shows that crypto mining is a far more energy-intensive process than the mining of its shiny counterparts. Researchers have been studying Bitcoin’s prodigious energy requirements for years, but this first-of-its-kind comparison helps put the crypto rush in context and further lays out the environmental toll. For those who have managed to avoid hearing how cryptocurrency works, a quick (and very simplified) primer. Cryptocurrencies are a form of payment that live on the blockchain, basically a digital ledger that tracks verified transactions. Crypto mining essentially adds a new block to the blockchain and with it the miner earns coins. The whole process of mining takes place in the virtual world where computers to do complex, computationally-intensive calculations, and the computer that solves the “problem” first is rewarded with said block. All those computations take a massive (and growing) amount of energy. Previous estimates show that the Bitcoin industry has the energy footprint of a small- to medium-sized country. The new research uses data about the energy use of Bitcoin as well as Ethereum, Litecoin, and Monero—three other popular cryptocurrencies—to expand our understanding of their energy consumption. The study found that over the past 30 months, crypto mining energy consumption has increased exponentially even as the market for all coins has become more volatile. “The amount of energy required now rivals developed countries like Denmark,” Max Krause, an environmental engineer at Oak Ridge Institute for Science and Education who led the study independently of his day job, told Earther. The researchers estimate that carbon emissions from mining run anywhere from 3-15 million tons carbon dioxide globally. But the carbon intensity, or amount of carbon emitted per transaction, varies widely by country. China—where many mining operations are centered because it’s cheap to setup shop there—is unfortunately also the most carbon-intensive place to mine. Canada is home to some of the world’s least carbon-intensive mining operations, emitting four time less carbon dioxide than those in China. The study notes that its estimates for cryptocurrency energy consumption could be conservative, since they don’t account for cooling and other energy-needy processes to keep mining operations humming along. But they are pretty in line with other research. Alex de Fries, an economist who has been doing Bitcoin calculations, praised the work for expanding our knowledge of other cryptocurrencies. All this talk of a digital currency’s environmental impact can still seem highly academic and far away. Krause said he wanted to add a comparison that “most people can understand or can conceptualize,” which is why the analysis also compares crypto mining to gold, platinum, copper, aluminum, and rare earth metals mining. The results show that outside of aluminum, crypto mining is by and large much more energy-intensive per dollar of value mined than its metallic counterparts. Krause said the point of the research isn’t to pass judgment on cryptocurrencies, but to help the public better understand that the intangible blockchain has very tangible impacts. He noted that improvements could reduce the industry’s impact over the long run. Switching the economy away from fossil fuels toward renewable energy could also help. In Canada, one of the reasons mining is so much less carbon intensive than China is because of copious hydropower. The falling costs of wind and solar should reduce the carbon emissions of crypto mining further.